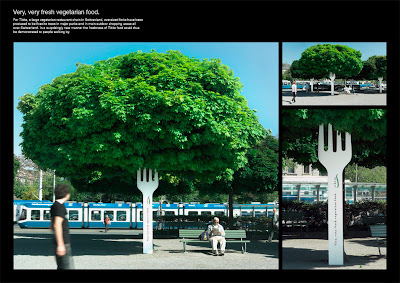 directdaily: Tibits vegetarian restaurant "Fork"
For Tibits, a large vegetarian restaurant chain in Switserland, oversized forks have been produced to be fixed to trees in major parks and in main outdoor shopping areas all over Switserland. In an surprisingly new manner the freshness of Tibits food could thus be demonstrated to people walking by. Vaude Outdoor Equipment "Extreme conditions"
Index Livingmall "Model Room Bags"
Amnesty International Croatia "The plate"
Loctite Super Attack "Business card"
Robert Harris Coffee Roasters "Lennox"
Memac Ogilvy "Recession business cards"
Etat Libre d'Orange "Tom of Finland shopping bag"
Salvation Army "This Campaign Cost Nothing"
Greenpeace Car Free Day 2009 "Key Saw"
Breast cancer awareness "Take her bra off"
Alumni Language School "Found In Translation"
SulAmérica Home Insurance "Wild Pets"
Alumni Language School "Translation Tag"
Windex "Glass So Clean It's Invisible"
Tom de Keizer "Learn real motorcycling"
GP Group "Hitting the target"
Breast cancer awareness "Stress Ball"
SBS Short Breaks "Champagne Spray"
1300 Flowers "PA Day 1300 Flowers"
Amnesty International "Frau im Koffer"
Friends of the Earth "Inhale"
Friends 91,9 FM "Monster Microphone"
Sandisk "Space for 4000 photos"
Green Project Awards "The green savers"
Amnesty International "Accomplice to a crime"